Beautifully engraved certificate from the Medical Times Publishing Company issued in 1906. This historic document has an ornate border around it with a vignette of an eagle. This item has the signatures of the Company’s President, M. Stimson and Secretary. The company published the Denver Medical Times and the Utah Medical Journal. 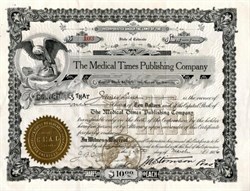 THE MEDICAL TIMES PUBLISHING COMPANY. 1839 Champa Street. Denver. Colo.